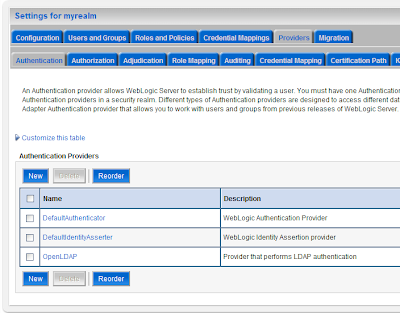 The post of Frank Nimphius on OTN over using OID as security provider in WebLogic inspired me to use OpenLDAP instead of OID. 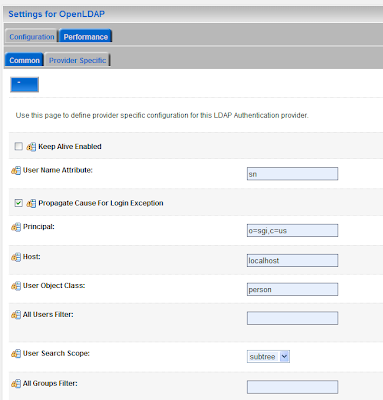 I will be using the standard LDAPAuthenticator for OpenLDAP too. Here are my steps to make it work. Here is the ldif file I used. Add some persons to the persons organisation unit. We can create a new group called ICT in the groups organisation unit and add the just created persons as member attributes. 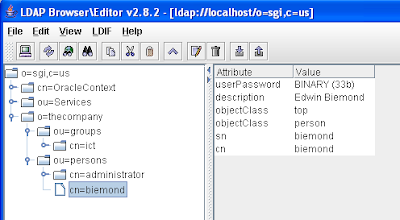 Select the OpenLDAP provider and go to the Provider Specific tab where we will change some properties. 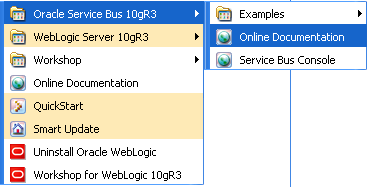 Oracle has just released the new Oracle Service Bus ( AquaLogic Service Bus ) which is a combination of the Oracle ESB and BEA AquaLogic Service Bus. So let's install it and give it a testdrive. 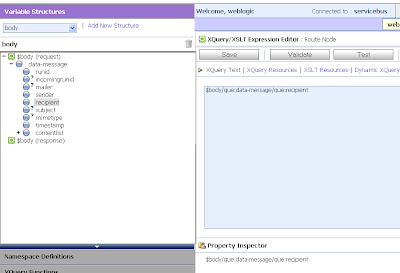 ( I am a Soa Suite expert so I am very curious to see how aqualogic works) . 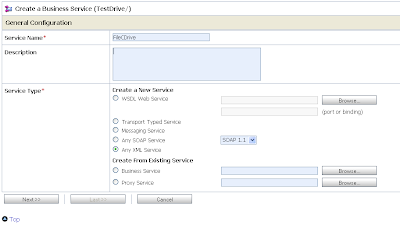 In this blog I will make a small ESB example where I use a JMS Queue and a Web service ( this are proxy services ) as input and the Service Bus will route these messages to my local C or D drive ( these are my business services). 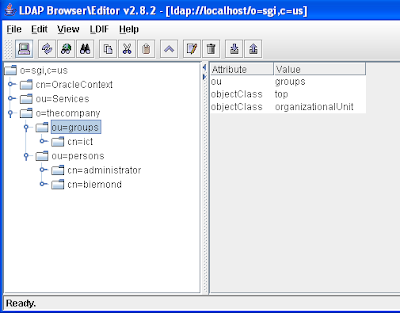 In this example I will only use the OSB console to configure my project, off course you can do it too in the eclipse workshop. First we have to start the Service Bus Console. use this url http://localhost:7021/sbconsole/ weblogic as username and password. 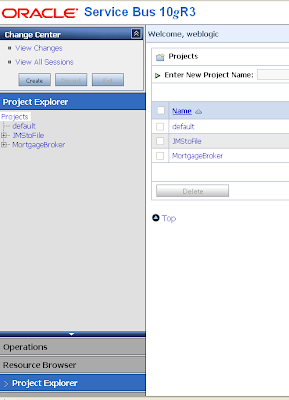 Now we can go the project explorer where we will create a new Project called TestDrive. Click the just created TestDrive project. 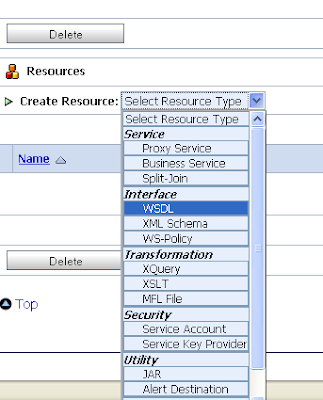 In this project we will create two folders called wsdl and xsd. Let add the business functions first. Create a new resource and select business service. Use as service type "Any XML Service"
Use File as protocol and add an file endpoint file:///c:/temp. Do the same for the D drive business service. 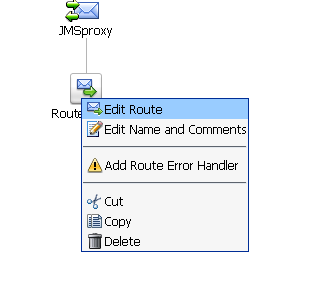 Click the JMSproxy and add "Add Route"
Add a routing table because I want to check an element in the message and then decides which business services I need use. 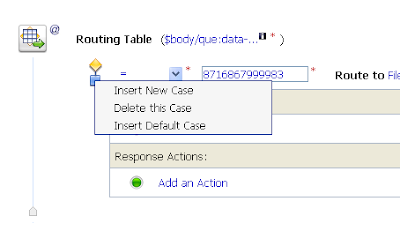 We have to add a default case. This case is used when the first expression is not valid. Just add a message to the queue or launch the test console of the JMSproxy. 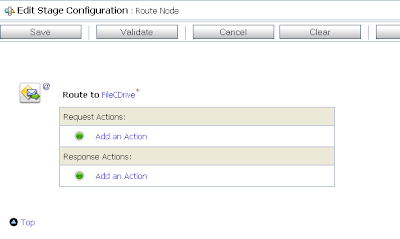 The next step is to to add a Web Service Proxy and add some routing to the C drive business service. 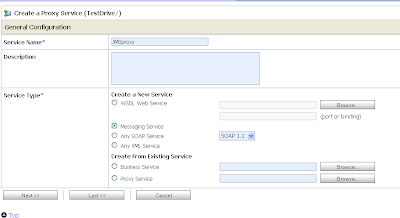 Create a new proxy service resource and use the wsdl we uploaded in one of the first steps and select the consume operation. 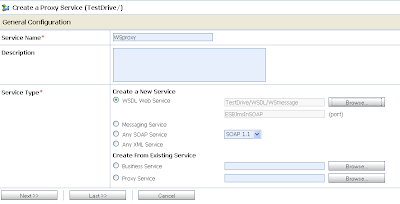 Use the ws protocol, later we can use http://localhost:7021/TestDrive/WSproxy to test our ws or to retrieve the wsdl. Add some routing to this proxy service. 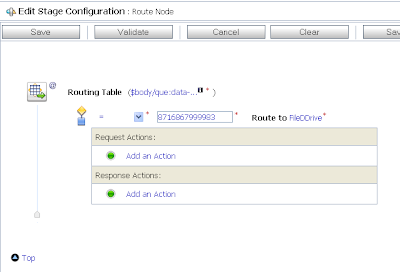 This time we only use the c drive business service so I can use Routing and not routing table. Activate the project and we are finished with our TestDrive project. 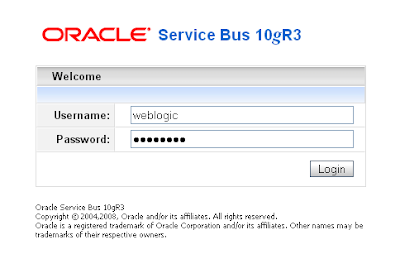 Conclusion: the Oracle Service Bus 10R3 is very easy to work with ( off course you need to have some basic knowledge about wsdl, xsd , jms ) and it was nice to see that you only have to use the sbconsole application to create the whole project. So the next time I will test the Oracle BPEL integration, Oracle Workshop, Data service providers, Performance and some complex routings. Making a download or an export was never so easy as in JDeveloper 11g just follow these steps and you have own a xml export file of a rich table or any viewobject used in the page definition. 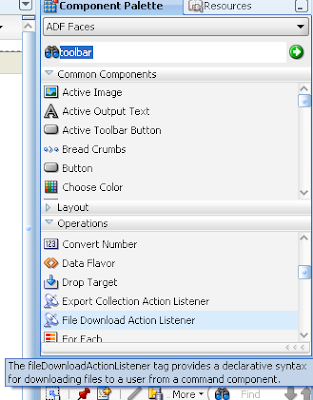 For this blog entry I will use ADF BC which supports writexml and the fileDownloadActionListener jsf component which handles the download of the file. 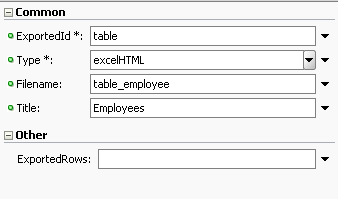 first we drag a new toolbar button to the panel collection of a rich table. 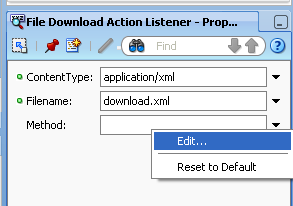 In the property window of this af:fileDownloadActionListener component we can fill in some values for the content type and filename properties. 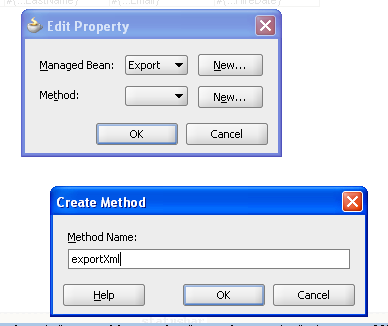 Select the edit menu item of the method property so we create an new backing bean. Now we can create a new method in this bean. 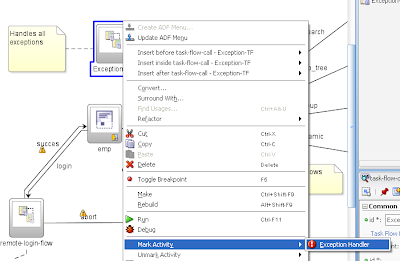 In this blog entry I will show you how powerful ADF Task Flow are and how it can save you a lot of time. You only have to build it ones and use it everywhere. In this example I use an Exception page in a bounded Task Flow as a reusable component. In every Task Flow you can define a Exception Handler which takes care of the not handled exceptions. So probably you build this exception page in every project. 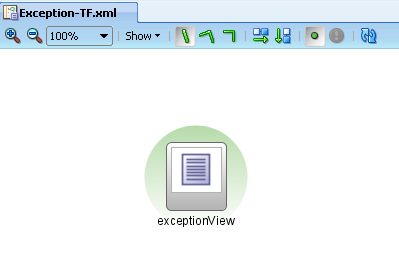 I only have to drag the exception Task Flow from the component palette to the Task Flow, define some input parameters and make this Exception TF the Exception handler of the application Task Tlow. 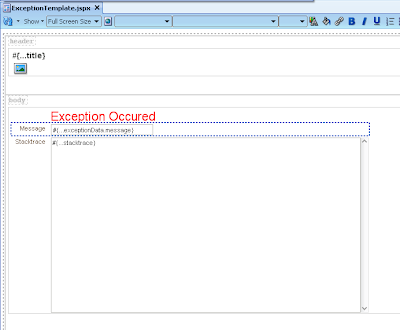 First we create a project where we add an exception JSF template. This template has two facets Top and Body and 3 attributes Title , Branding ( Image component ) and Stacktrace. 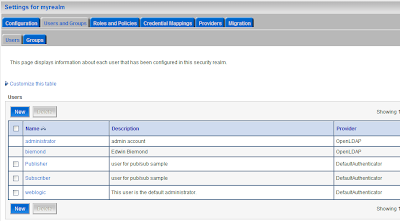 Now we can add a new deployment profile to this project , select the ADF Library JAR File and deploy this template. 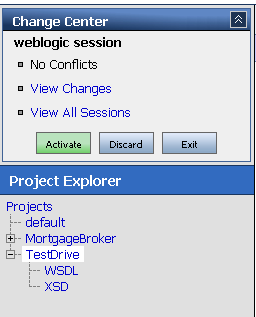 Create a new project with a bounded Task Flow ( de-select the page fragments option ) . In this Task Flow we add a new view. 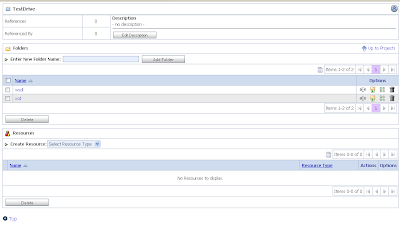 Add the Title and Branding input parameters to this Task Flow definition. Add this bean as backing bean in the bounded TF. 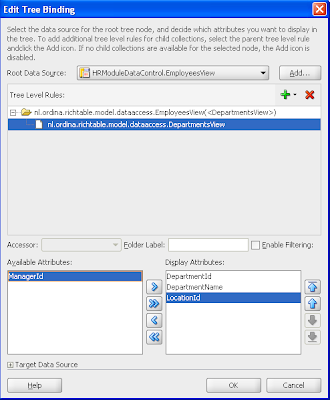 Create a new deployment profile , select the ADF Library JAR File and deploy this Task Flow. Put some values to the Title and Branding parameters and we are finished. Here is the project code. 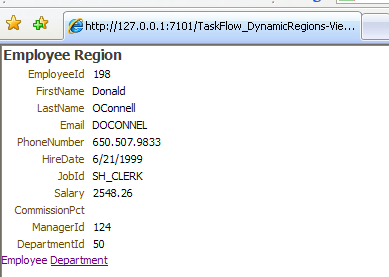 In my previous blog about ADF Task Flow Dynamic Regions I used a ADF Tree to switch from employee to department Task Flow region. 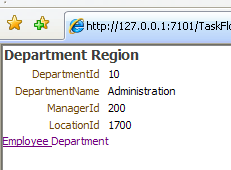 In that example I added two commandLink to the tree and changed the backing bean of dynamic region to make it work. I discovered that JDeveloper 11g can do this a lot faster. Just create a dynamic region. 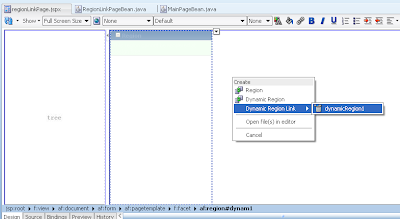 After this you can drag your Task Flow Region definition from the Page Flow folder in the Application Navigator and put it somewhere on the page where you want a commandLink then you will get Dynamic RegionLink option. 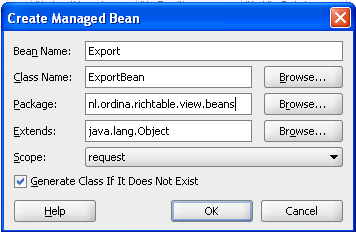 This will create a commandLink and adjust the dynamic region backing bean. If you also want a link to the first region of the page or more links to a particular region, just drag this Task Flow again on the page and it will create a new link. 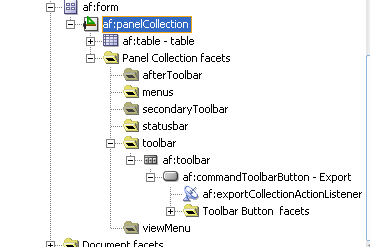 Probably you already know or saw that the new Rich Table of ADF 11G is very fancy but in this blog I will show you how to make it much cooler but adding some standard ADF components to it. With this as result. 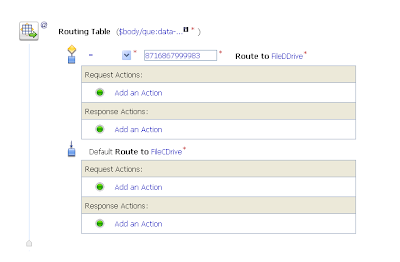 With Detach you get a maximized page where only the table is shown. 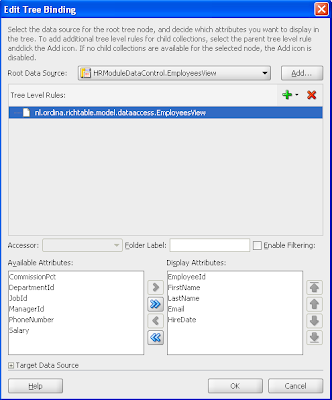 This example based on the department and employees table of the HR demo schema. 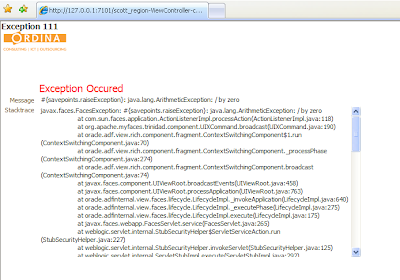 The first step I did, is to drag the employee viewobject from the data control to the JSF page. 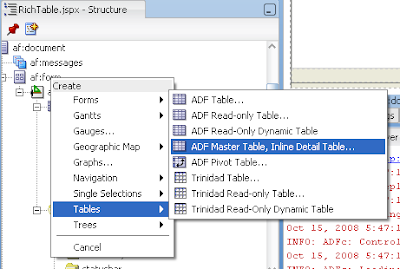 I choose the ADF Master Table , Inline Detail Table option. Employee is my case the master and department is the inline table. 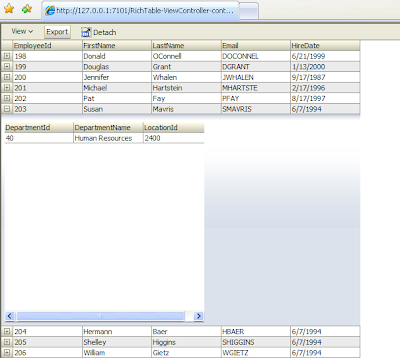 Then drag a PanelCollection to the page and move the just created table to this PanelCollection. In the toolbar facet of the PanelCollection we add a toolbar with an commandToolbarButton. 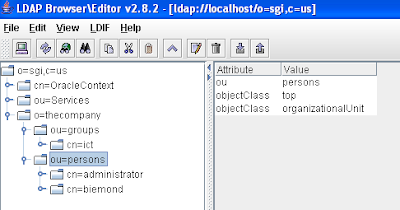 Drag the exportCollectionActionListener on this toolbar button and give the Rich Table as Id "table".